Hot tubs/jacuzzis are the ultimate in relaxation and immersing yourself in warm water can be very rejuvenating. If you’ve booked to stay in one of our holiday homes with a hot tub or jacuzzi make sure you read this guide to maximising your experience! There are a few different types of hot tubs. Scandinavian-style wooden tubs often don’t have bubbles and are instead used to soak and relax in, whereas a jacuzzi has jets that create a ‘bubble effect’. The obvious choice here is Champagne or Prosecco! There’s nothing more indulgent than sliding into your own private hot tub with a glass of bubbles in one hand. For extra decadence, try elevating your drink by adding some amaretto or cherry liquor. We’d also advise keeping a bottle of water nearby to keep you hydrated! Create a calm mood by lighting some candles or burning some essential oils. Scent can be a powerful relaxation tool, with lavender being one of the most versatile and popular. Make sure your towel or robe is in reaching distance – this is especially important if you’re outdoors and want to avoid a freezing cold dash across the terrace! If you’re looking for some deep relaxation, Salcombe Finest can arrange to have a trained massage therapist come and give you a post-soak massage. 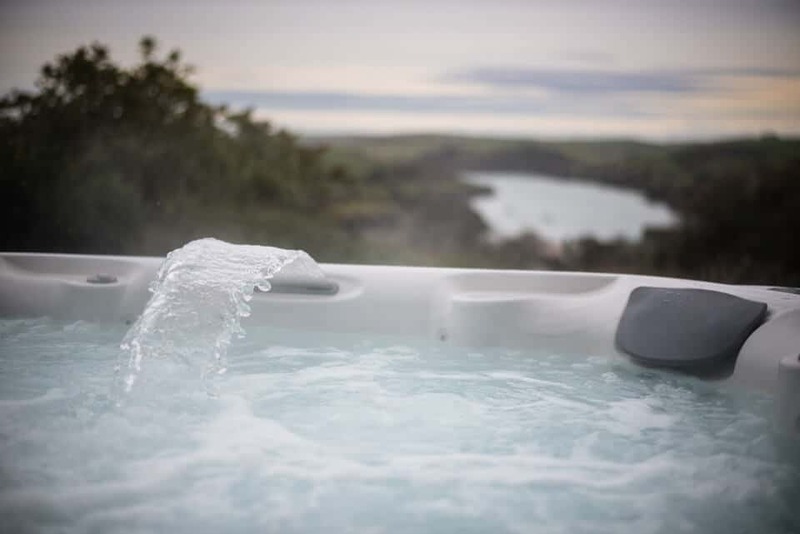 What you listen to is completely up to you – although we would always recommend listening to classical music as you soak in your hot tub enjoying views over the estuary. Many of our properties have speakers that you can connect to your smartphone – so make sure you create some playlists before you set off on holiday. Wood fired Swedish style hot tub. Normal heating elements will actually heat the water in the main, but you can light your own fire for the authentic Swedish experience and top up the temperature! Very private with no-one overlooking you. Views down the beautiful Bowcombe Creek and over the Salcombe-Kingsbridge estuary. 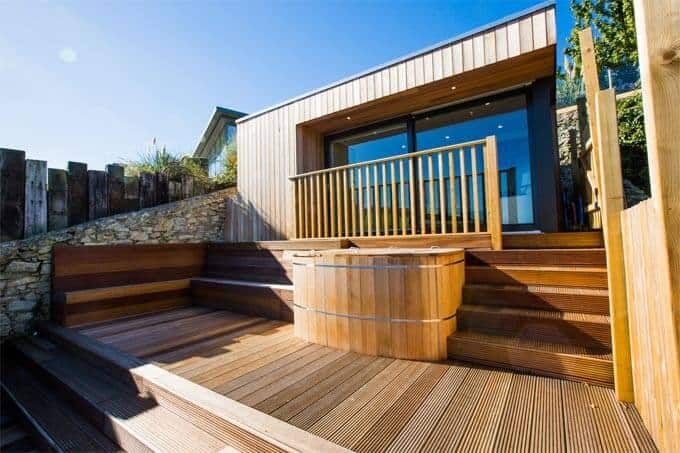 Wooden (cedar) hot tub (not a jacuzzi so no bubbles) with epic views over the Salcombe estuary. Normal style jacuzzi with bubbles sunk into the wooden terrace. Look out over Salcombe town and watch the sky change colour with the setting sun. Slightly saline jacuzzi which means fewer chemicals so nicer on the skin. Watch epic sunrises in the tub or chill out in the afternoon/evening. A beautiful distant view over Salcombe. This luxury holiday home has a large jacuzzi and can sleep up to 24 so perfect for a celebration. Very private and nestled in the canopy of the trees. 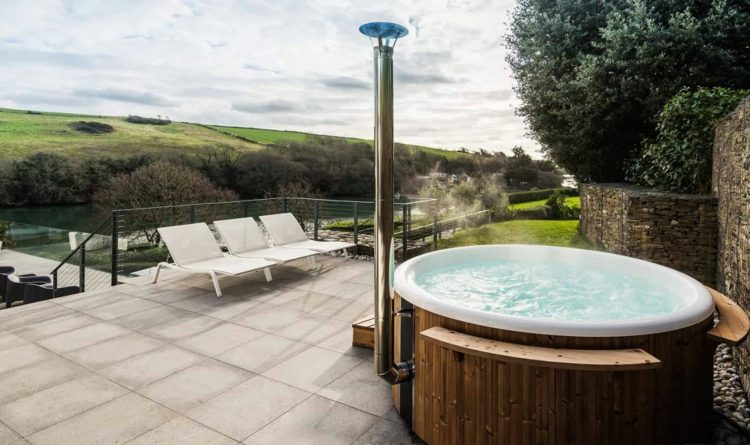 If you want a holiday to relax and unwind then choosing a holiday home in Salcombe with a hot tub or jacuzzi makes perfect sense. Make your next escape one to remember! Contact us today and take the first step towards the bubbles.